The share prices of the United Airways dropped by 7.63 percent today, a day after the private airliner cancelled all its flights for an indefinite period due to fund crisis. At the closure of trading at Dhaka Stock Exchange (DSE) — the country’s premier bourse –today, the market price of United Airways share stood at Tk 10.90, which was Tk 11.80 at the end of trading yesterday. The price will not decrease further as per circuit breaker rule of the DSE rule which does not allow a stock price to go down or up by a certain level. Meanwhile, the authorities of the private airliner did not inform the DSE authorities about their suspension of operation, said Swapan Kumar Bala, managing director of the DSE. “We now are taking steps in this regard,” he added. As per rules, any company or organisation should inform the DSE authorities about any decision they take, he said. Last evening, flight operation of the United Airways, which was listed with the stockmarket in 2010, was suspended for an indefinite period, after the private airline’s new board failed to come up with plans to keep it afloat. 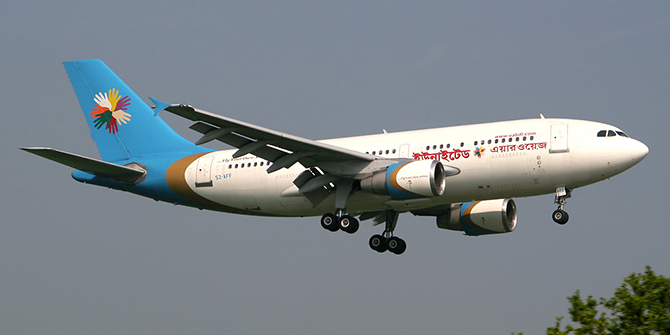 “Our flight will be suspended indefinitely from this evening onwards,” flight operations director of the troubled airline M Elias told a news briefing at its headquarters in Uttara yesterday. Members of the new board, reconstituted on Monday after its founder Tasbirul Ahmed Choudhury was forced to resign, did not come to office for the last three days to guide the carrier out of crisis, he said at the briefing.